Montréal (Québec), February 3rd, 2011. – The 2010 Canadian, American, and North American Rally Champions, Antoine L’Estage of St-Jean-sur-Richelieu, Qc and Nathalie Richard of Halifax, NS will return to competition this weekend to contest Maniwaki’s Rallye Perce-Neige, the first round of the 2011 Canadian Rally Championship. L’Estage, the Rockstar Royal Group team driver, is looking for his fourth victory at the Rallye Perce-Neige after winning this challenging winter event three times in the past five years. 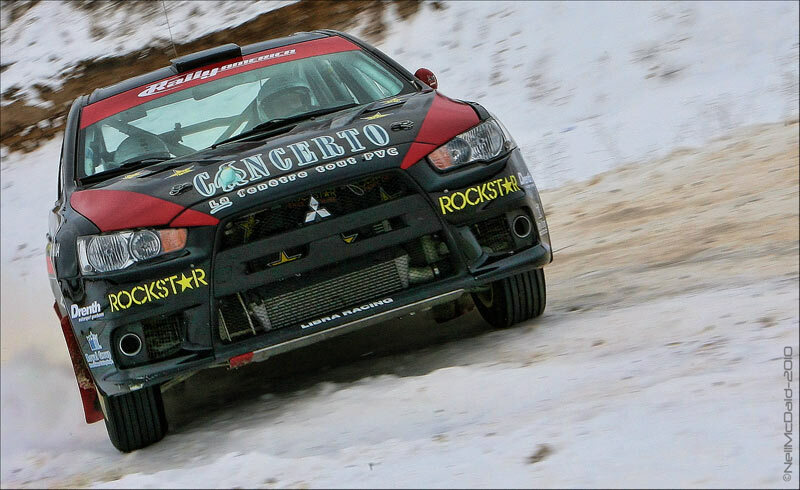 «The Rallye Perce-Neige is an event that I always enjoy and the time I’ve had in my Mitsubishi Evo X in the past two weeks has left me really excited to contest this rally » indicates Antoine L’Estage, who adds : « even with a such a fantastic season last year, Perce-Neige was the only rally that we didn’t score points at. I want to redeem myself this year and come away with top points. Winning is obviously a main objective but the priority, as always, remains our need for important championship points ». The Perce-Neige rally is known for its tricky snow and ice-covered roads, something that does not stress Antoine L’Estage, who relies on his Yokohama tires : « having this lineup of Yokohama tires available to us is key, including the best intermediate winter tire for performace rallying » he indicates. At the wheel of his Rockstar Royal Group Evo X, Antoine L’Estage knows that repeating his record-breaking 2010 season will be difficult, but anything’s possible : « winning the “Triple Crown” (Canadian, American, and North American titles) does not come by easily. I’d like to do it again but my priority is the Canadian championship. My entire team is geared up and highly looking forward to the Perce-Neige rally » he explains. The Rockstar Royal Group team took part in last weekend’s Sno*Drift Rally in Michigan, Round 1 of the 2011 Rally America season, the premier American series that was won last year by the L’Estage/Richard duo. After winning the first three competitive stages of the rally and building up a 20 second lead, the team’s rally was ended early in a small snowbank. The contact resulted in a damaged radiator, causing the motor to overheat once the team got going again. « It was a very positive start to the rally because we were able to show our speed but we couldn’t risk continuing after the car started overheating » shared the Quebec driver. L’Estage’s main rival in the Rally America series also retired early from the rally, denying either team a points advantage in their hunt for the title. Antoine and Nathalie return to the American season at the end of February for Missouri’s Rally in the 100 Acre Wood. Antoine L’Estage holds three North American championship titles (2007, 2008, 2010), three Canadian titles (2006, 2007, 2010), one American title (2010), and twenty-five overall victories in Canada and the US. Nathalie Richard holds six overall national championship titles (3 in Canada and 3 in the USA), as well as thirty-one overall rally wins on both sides of the border. She is also a six-time North American Co-Driving Champion (2004 – 2010, excluding 2006).